Could this battery finally make electric cars mainstream? The makers claim it could triple the range of electric vehicles for a fraction of the cost. The far-too-short life of smartphone batteries may have become one of those things everyone loves to complain about, but it’s not exactly holding the market back. 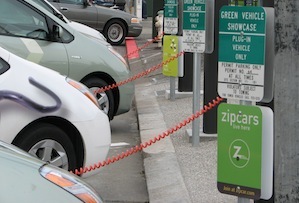 The same cannot be said of electric cars – after all, you can still use your phone when it’s plugged in. The other big gripe with electric cars is their cost – the Tesla Model S, reviewed in MT’s October issue, currently sells for £100,000. The makers of a new lithium battery claim it could solve both those issues – and be ready for market by 2016. The battery (not the first lithium one) can triple the range of an electric vehicle (the Model S’ range is 312 miles at the moment) and double the cordless life of a smartphone or laptop, Dr Qichao Hu, who developed it with his former MIT professor Donald Sadoway, told the FT. It is 20% cheaper than existing electric car batteries and also doesn’t need the temperature control systems that others require to stop them catching fire, Hu said. At the moment, batteries make up as much as 30% of an electric car’s cost. ‘We’ve got to get a car on the showroom floor for $30,000 (£18,700), not $130,000 and the big piece is the battery: it’s too expensive and it runs down too fast,’ Professor Sadoway said. The battery, which Hu rather optimistically hopes will be ready for use in consumer electronics in the first half of 2016 and electric cars in the second via his company Solid Energy, doesn’t solve the problem of a lack of charging stations and the time it takes to juice up (although drivers might be less concerned about the latter if they have to do it less often). But it was still labelled as ‘game-changing’ by Arndt Ellinghorst, the head of automotive analysis at investment researchers ISI Group. Moreover, independent experts in the US have confirmed the prototype battery cells can store twice as much energy as normal ones, according to the FT. Plenty of people are trying out new things with batteries, as the improved technology has meant they are commercially viable and their possible uses have consequently increased. Tesla’s solution to the cost issue has been to invest $5bn in a new battery ‘gigafactory’, betting on economies of scale rather than new technology (Hu said he was in talks with Apple and Tesla – both declined to comment). With enough investment, the cost of batteries will eventually come down and their use will go up. But those trumpeting electricity as a solution to all our environmental woes should remember that, like fossil fuels, lithium is a finite resource.